How Big, How Blue, How Beautiful is Florence + The Machine’s third studio album. The first two efforts had been solid to advanced and there was obviously a lot of talent within them, but there is certainly potential for more and there is no better time to do so than by your third album. Florence Welch is known for combining emotive lyrics with a passionate and emotional delivery, but here the danger lies in losing that as a sound or idea is reworked as it is set to be with this album. If she can maintain her core strengths whilst adding a little dynamism to her catalogue of songs then it will be a great success, if not then it’ll be a pretty decent effort nonetheless. ‘What Kind of Man’ features vocals that open the track in perfect isolation until the song takes a sudden, low slung rock turn with bursts of grinding riffs and a stomp-like percussion. These slip in and out between more smooth transitions led by her vocals and are given an enthused drama and grandeur. It’s not a wondrous track, but it is certainly one that is produced and arranged very effectively to still set up Florence for a fiery delivery of quite fiery lyrics. ‘Ship to Wreck’ is a little more laid back in it’s emotion and a little more mellow in it’s delivery with it’s lapping acoustic riffs and sweeping lead guitar elements with the tambourine shimmer behind it. The song is still very direct and engaging as a nice Pop-Rock track, but without Florence and her vocals you’d probably let this song pass you by. In this sense it’s perhaps a little too over-reliant on her vocals and could have been so much more instrumentally, but a direct song either way. ‘St Jude’ is a song that’s contemplative and subtle with it’s lightly whirring vocals and the echoed vocals sat in front of them. The song remains intimate and is beautifully arranged and delivered with the most gentle shifts in sound and showcases the lyrics of searching and being lost within yourself and is perhaps more revealing that it initially seems. Add to this a wonderful, trembling vocal and it’s a effortless, soft ballad. ‘Delilah’ highlights a more driven and direct with an even greater focus on her vocal capabilities in their subtle isolation. With this track, the instrumentation builds up around it and accommodates it at every point as it builds and dissolves in volume. Once the song finds it’s rhythm it remains sharp and simple with a crispness and steadiness; a solid foundation for Florence to demonstrate her vocal ability. 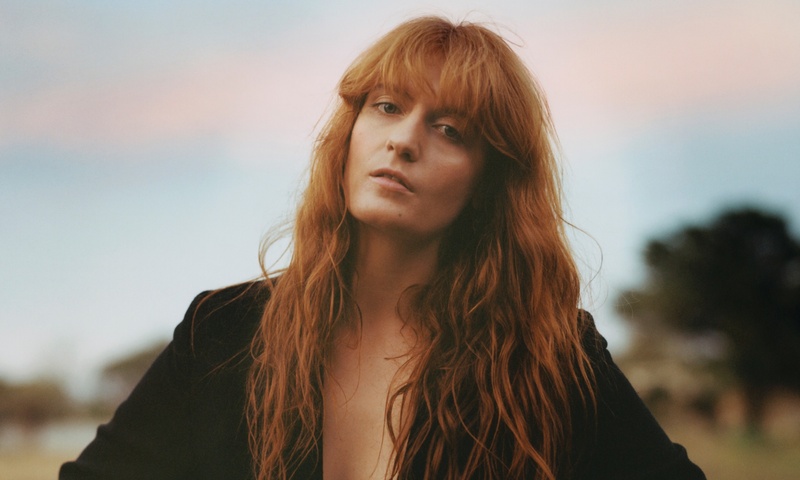 This track and indeed the album seems to be focused upon her vocals via the simple hooks or more atmospheric and minimalistic tracks and if you’re going to focus on any vocal, Florence’s aren’t going to lose your attention. A track that did with ‘Ship to Wreck’ could have done. The title track is a song with a muted, nudging rhythm from the rich organ sounds, but progresses into a track that features a pretty dull instrumentation that not even Florence’s vocals can inject life into. ‘Queen of Peace’ is more akin to the singles ‘Delilah’ and ‘Ship to Wreck’ whilst ‘Various Storms and Saint’s and ‘Long and Lost’ are just two more sparse tracks with Florence’s vocal the only point of interest. With this we discover the problem of the album. It relies too much on the vocal delivery instead of adding to it and this puts an even greater focus on the lyrics which simply weren’t as good as they have been previously. Having said that, it’s still an album of a high standard in that it isn’t weak in any place, just not as strong as it could have been. Florence Welch has released one of the last singles off Florence and the Machine’s upcoming third album How Big, How Blue, How Beautiful which is released on June 1st. ‘Delilah’ along with the previous singles off the album, highlight a more driven and direct approach this time around with an even greater focus on her vocal capabilities in their subtle isolation. With this track, the instrumentation builds up around it and accommodates it at every point as it builds and dissolves in volume. Once the song finds it’s rhythm it remains sharp and simple with a crispness and steadiness; a solid foundation for Florence to demonstrate her vocal ability. This track and indeed the album seems to be focused upon her vocals via the simple hooks or more atmospheric and minimalistic tracks and if you’re going to focus on any vocal, Florence’s aren’t going to lose your attention. Filed Under: Music Tagged With: 2015, Blur, Earl Sweatshirt Grief, FKA Twigs, Florence and the Machine, Glass and patron, Lampshades of fire, Modest Mouse, Music Video, St Jude, The Go! Team, There are too many of us, This weeks music video, What D'You Say?